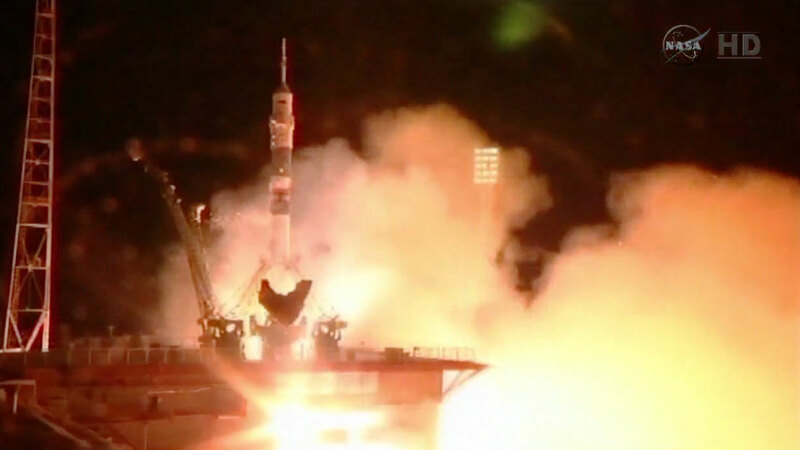 A new Expedition 41/42 trio is on its way to the International Space Station after lifting off at 4:25 p.m. EDT from the Baikonur Cosmodrome in Kazakhstan. Soyuz Commander Alexander Samokutyaev and Flight Engineers Barry Wilmore and Elena Serova are on a six-hour, four-orbit ride to the International Space Station inside the Soyuz TMA-14M spacecraft. There will soon be five spacecraft docked to the station reaching its maximum visiting vehicle capacity. There will be two Soyuz vehicles, one Progress 56 resupply ship, Europe’s “Georges Lemaître” ATV-5 and the SpaceX Dragon commercial space freighter which arrived Tuesday morning. The Poisk docking compartment will host the new Soyuz when it docks at 10:15 p.m. Hatches between the Soyuz and the station will open around 11:55 p.m. after leak and pressure checks. The new crew will then float into their new home for a welcoming ceremony and congratulatory calls from family, friends and mission officials in Baikonur. After the ceremony has ended the new crew will undergo a mandatory safety orientation to familiarize themselves with escape paths and procedures and locations of safety gear. Wilmore is starting his second visit to the space station. He piloted space shuttle Atlantis in November 2009 which delivered two EXPRESS Logistics Carriers carrying station gear and returned Expedition 20/21 Flight Engineer Nicole Stott back to Earth. Samokutyaev is beginning his second stint at the orbital laboratory having served as an Expedition 23/24 Flight Engineer. He is replacing Skvortsov, who left the station two weeks ago, who also served as his crewmate in 2010. Serova is on her first mission as a cosmonaut. She is Russia’s first female cosmonaut to live and work on the International Space Station. They will join their orbiting Expedition 40/41 crewmates Commander Max Suraev and Flight Engineers Reid Wiseman and Alexander Gerst. The international crew from Roscosmos, NASA and the European Space Agency has been aboard the orbital complex since May 28 and are due to return home Nov. 9. Some of the cargo flown aboard this Soyuz will be used in research investigations that are either ongoing or planned aboard the International Space Station. Items such as questionnaires will be delivered to obtain in-flight data about crew member characteristics, such as day-to-day changes in health or incidence of pain or pressure in microgravity. One such investigation is Space Headaches which uses questionnaires to collect information about the prevalence and characteristics of crew members’ headaches in microgravity. This information is used to develop future countermeasures for headaches often caused by intracranial pressure change. Researchers will also use biological sample kits delivered by the Soyuz spacecraft to obtain samples of blood, saliva or urine. The ongoing collection of biological samples from crew members help scientists determine if immune system impairment caused by spaceflight increases the possibility for infection or poses a significant health risk during life aboard the space station.